Doug Scrivner, former General Counsel of Accenture, retired in 2011 after 31 years with the company and 14 years as General Counsel. During his tenure, he built a legal group of over 400 lawyers in 35 countries and also oversaw the company’s government relations function and served as Corporate Secretary, Compliance Officer and as a member of Accenture’s Executive Leadership Team. Mr. Scrivner has participated and held leadership positions in several educational and professional organizations. 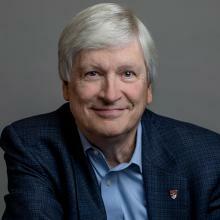 At the University of Denver this has included serving as a member of the Board of Trustees of the University of Denver, where he was Chair from 2014 to 2018 (and designated Chair Emeritus in 2018), and chairing the Advancement Committee during the public phase of DU’s ASCEND comprehensive campaign; Chairman of the Visiting Committee, University of Denver Sturm College of Law; National Co-Chairman of the Second Century Campaign, University of Denver Sturm College of Law; member of the Advisory Board of Educating Tomorrow’s Lawyers at IAALS; and member of the executive committee of IAALS and the Barton Institute for Philanthropy and Social Enterprise. He has also served as an adjunct professor at the Sturm College of Law. He has served as a member of the Board of Visitors, Sanford School of Public Policy, Duke University; a member of the Arts & Sciences Campaign Committee, Duke University; co-chair of the Sanford School campaign committee in Duke’s Duke Forward campaign; a member of the board of the Gladstone Institutes Foundation in San Francisco; a member of the Advisory Board to the Diversity and Flexibility Alliance (formerly PAR); a member of the California State Bar Academy Strategic Task Force; and an occasional guest speaker at UC Berkeley School of Law, Northwestern University School of Law, Daniels College of Business and Sturm College of Law. Mr. Scrivner received an A.B. in political science and history from Duke University, an M.Sc. in international relations from the London School of Economics, and a J.D. from the University of Denver Sturm College of Law.